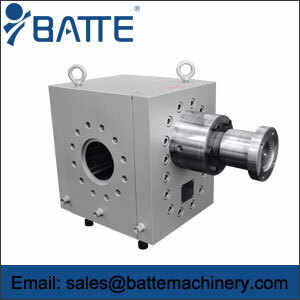 The hot melt pump or gear pump for all applications in extrusion, plastics processing and compunding. 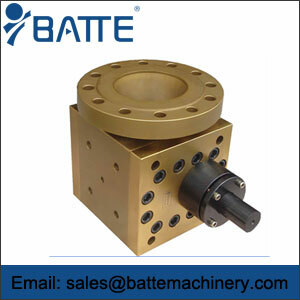 Melt gear pump can be used for plastic processor and compounder for their properties. 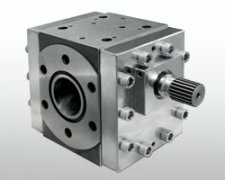 The gear pumps for all applications in extrusion, plastics processing and compunding. To relieve pressure from the extruder and for a gentle, efficient and constant flow in the extrusion of film, sheet profile and pipe and for granulation (compounding). The amount of regrind can be increased up to 100% by using an Batte melt pump (gear pump). a fully integrated solution from just one supplier. Aggregates optimally fitting to each other for a continuous and economical use of the machines. With our pump unit we reach this aim! A ready-to-use unit to retrofit the existing extrusion line, an unit which guarantees highest process security. 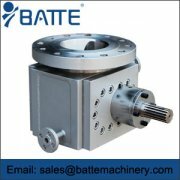 To extend the service period Batte offers a rework and modification of your melt pumps you use today. The gears and slide bearings made from tool steel are important. 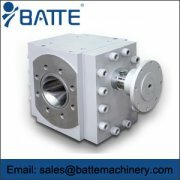 With the viscoseal and cover combination developed by Batte, flow optimized, we can bring hot melt pump of the first generation from our competitors to the state of art in technology. Our customers experience much better a behavior in colour change. Please contact us and convince yourself of our quality, short delivery times and fair prices!